IMPERIJ VRAČA UDAREC NAPREJ / EMPIRE STRIKES BACK & FORWARD : The artivistic comment on the society of Ljubljana, reaching back to ancient Emona. The paintings on steel look ‘heavy’, while the sewn fabric figures give the impression of ‘light’ and playful matter. The project Empire Strikes Back & Forward (the title alludes to one of the Star Wars films) is conceived as a recurring annual exhibition that will establish a dialogue among visual artists (emerging and established contemporary painters, sculptors and intermedia artists) from both closer and more distant areas of Europe. 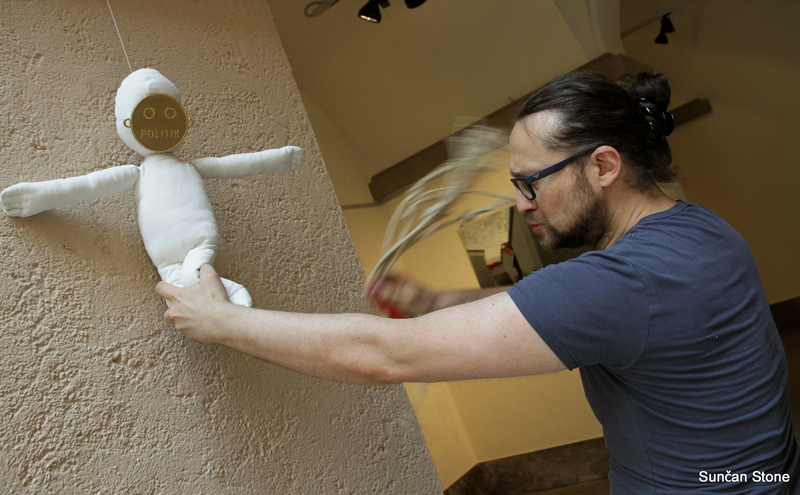 In May 2014, the Institute for Arts Gulag produced the first independent exhibition of Slovenian artists that was held in the Ljubljana Town Hall. 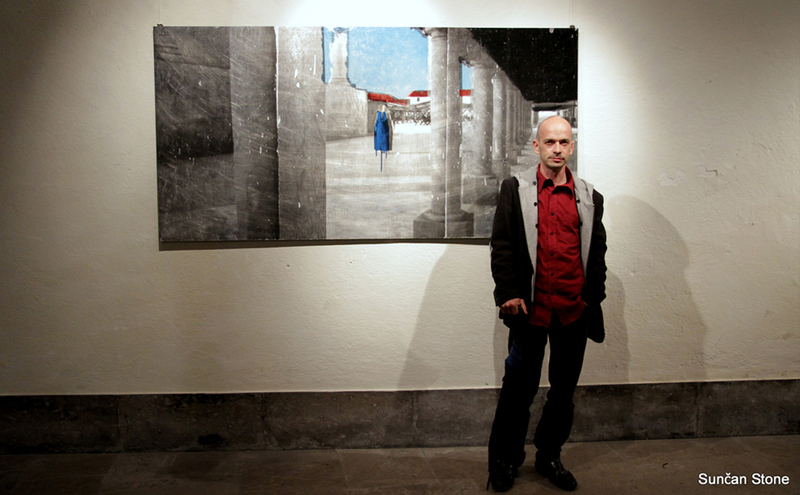 It presented the reflections of two artists (a painter and a sculptor) on the wars in Slovenia: upon the centenary anniversary of the start of World War 1; the 75th anniversary of the end of World War 2 and the Roman wars upon the 2000th anniversary of the start of ancient Emona (the Roman predecessor to Ljubljana). 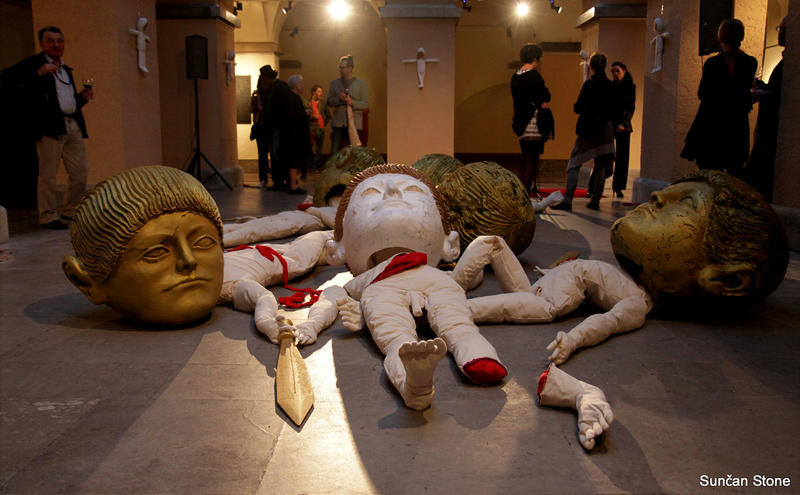 The artists use these war themes to contemplate violence and its consequences: dehumanisation. Projekt Empire strikes back & forward je zamišljen kot ponavljajoč se, večletni razstavni opus, v katerem bodo vzpostavili dialog vizualni umetniki z ožjega in širšega območja Evrope. Zanimajo jih zgodovinske, kulturne, eksistencialne ter politično aktualne teme v okolju, ki nas hkrati združuje in deli. V prvi samostojni, zaokroženi razstavi letos je umetniški razmislek namenjen refleksiji vojn na področju Slovenije: spričo stoletnice 1. svetovne vojne, petdesetletnice 2. svetovne vojne ter rimskih vojn v času Emone. Gorazd Krnc in Zoran Srdić Janežić sta uporabila zgodovinsko temo za razmislek o nasilju in njegovi posledici: Razčlovečenju.